The result of the French fourth generation fighter program is the multi-role Rafale. It has a delta wing design with canards to optimize aerodynamic efficiency and stability control. It is powered by two French built M88 afterburning turbofans. The engine intakes are positioned semi sunk in the fuselage. The aircraft is equipped with the multi-mode RBE2 radar which has full air-to-air and air-to-ground capability. It can carry a wide range of weapons, including the APACHE stand-off munitions dispenser and the ASMP nuclear missile. The designation Rafale A is used for prototype versions of the design. The two-seat Rafale B was designed as a dual control conversion trainer for the single seat Rafale C. But the Rafale B has now developed as a fully operational variant with full combat capability. Either an instructor, a second pilot or a WSO can assist the pilot from the rear seat. The Rafale B and C aircraft entered Armée de l'Air (French Air Force) service from 2002 onwards to replace its older Mirage variants and Jaguars. The type now starts to replace the Mirage 2000 fighter and fighter-bomber fleet. Designed especially for the Aeronavale (French Navy Air Arm) is the carrier capable Rafale M. The Rafale M has for 80% the same structural design and for 95% the same systems as the Rafale C. It has strengthened main undercarriage, extended nosewheel suitable for catapult launch, hydraulically operated arrester hook, but has no folding wings. The centreline pylon has to be removed because of the longer nosewheel undercarriage. 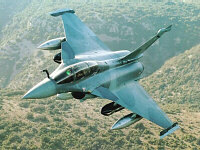 The first production Rafale M aircraft replaced the remaining F-8E(FN) Crusaders in the fighter role. Subsequent deliveries replaced the Super Etendard and Etendard IVP in the attack and recconnaissance roles.